Staff and students at The Sixth Form College, Solihull will be rewarded for excellence and effort at the annual Awards Evening later this month. Among those getting prizes will be students who have achieved a special award known as College Colours. Joel Reid (aged 18, from Birmingham) is one of those students. He has demonstrated team work, leadership and social responsibility, as well as completing an ambitious Stretch and Challenge activity. Those are the four strands needed for a student to achieve College Colours, which is open to any student who is in receipt of a commendation from a member of staff. Joel’s College Colours was achieved thanks to his completion of the Duke of Edinburgh Gold Award, as well as achieving his Grade 8 piano certification and learning to play double bass. He also undertook a volunteer project in Cameroon, which was part of work completed with a charity known as ‘Meal a Day’. This charity provides help for disadvantaged people in many developing countries, giving them fresh water and the necessary food to sustain life. Among the specific activities that Joel participated in was a visit to a blind and handicapped school in a village called Bengwi, where many of the children were severely disabled by conditions such as Polio and severe malnutrition. As well as volunteering in Bengwi, Joel helped restore the water supply in a village called Benakuma. “We were led to a broken water pump,” explained Joel. “We dismantled the pump with help from the villagers by hauling up the 25 meter pipe out from under our feet in order to find the problem. We eventually found a termites nest in the pipe, cleaned it out and inserted it back into the ground so that it could be used again to provide fresh clean water for the village. As well as his volunteering, Joel set himself an ambitious Stretch and Challenge activity to raise money for charity. 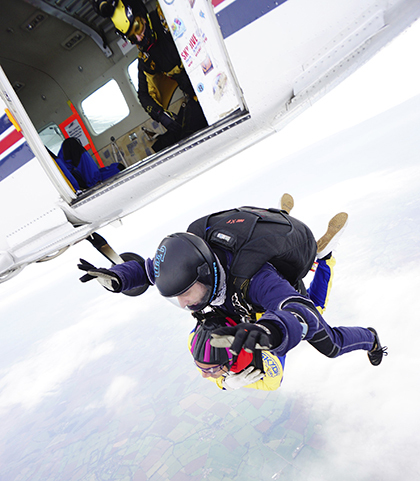 He completed a sky dive from 13,000 feet to generate sponsorship for the Birmingham Children’s Hospital. Joel’s motives were very personal as he explains.